Professor Charles King was the Ion Ratiu Chair of Romanian Studies at Georgetown University for 15 years. Unlike his predecessor (Gail Kligman) and his successor (Dennis Deletant) http://www.ratiudemocracycenter.org/index.php/en/democracy-award-lecture/the-ion-ratiu-chair-of-romanian-studies, both of whom have written almost exclusively about Romania and who are automatically identified as Romanianists, the same cannot be said about Dr. Charles King, who wrote fantastic works during his time as Ratiu Chair, although he wrote virtually nothing about Romania itself. This didn’t prevent him from fulfilling the role of reviewer and critic of works about communist and post-communist Romania. His review of the Presidential Commission for the Analysis of the Romanian Communist Dictatorship’s Final Report (“Remembering Romanian Communism,” Slavic Review, Winter 2007, pp. 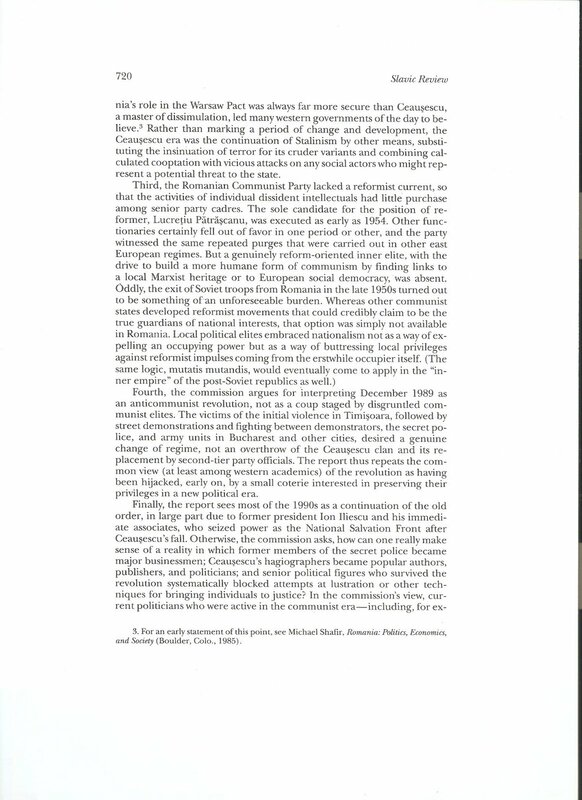 781-723, http://www.jstor.org/stable/20060381?seq=1#page_scan_tab_contents ) is case in point. Yes, Professor King knows Romanian and uses Romanian-language sources, but he fails to use them to add significant new insight and, worse yet, he misses a lot of literature someone writing such a piece should be familiar with and should address, as I pointed out back in 2008-2009 in my review (below) of his review of the Final Report’s discussion of the Romanian Revolution of December 1989. True, King started his scholarly career in the early 1990s with a series of reviews of books and articles about the Romanian transition from communism and the fall of the regime of communist dictator Nicolae Ceausescu, but he has never actually researched those events himself (a strange situation, which has both big positives, but also big negatives as a reviewer). While his 2007 review has some decent points, in “its present form” it left/leaves much to be desired. All of this eludes Charles King in his Winter 2007 Slavic Review essay “Remembering Romanian Communism.” In his five page essay, he pauses no less than four times to mention the Revolution, despite the fact that its coverage takes up barely one percent of the PCACDR report. He relates the most banal of conclusions—“The report thus repeats the common view (at least among western academics) of the revolution as having been hijacked…”—yet misses or avoids what Iliesiu clearly seems most proud of: having inserted the claim that Nicolae Ceausescu was responsible for “only 162 deaths,” thereby insinuating Ceausescu’s successors bear responsibility for the other 942, and the claim to which such a reckoning is intimately related, namely Voinea’s that there were “no terrorists.” (It is interesting to note how Iliesiu et. al., the eternally suspicious of the state, miraculously become assiduous promoters of “official” and “state” claims once they turn out to be their own, thereby suggesting that their skepticism of the state is primarily situational rather than inherent—these are not equal opportunity skeptical and critical intellectuals.) King’s treatment of the Report is overall insufficiently informed, and as a consequence contextually-wanting and one-sided. He cites a handful of Romanian reviews of the Report, but they are almost uniformly positive accounts, almost as if supplied by the Chair of the Commission himself (see fn. 1, p. 718). He pauses to cite the former head of Radio Free Europe’s Romanian Research Division Michael Shafir’s 1985 book, yet makes no mention of Shafir’s trenchant criticisms (he gave the report a 7 out of 10 and mixed the positive with the negative) in a 1/12/07 interview in Ziua de Cluj, his extended critique “RAPORTUL TISMĂNEANU: NOTE DIN PUBLIC ŞI DIN CULISE” available in spring 2007 at http:// www.eleonardo.tk/ (no. 11), or his “Scrisoare (ultra)deschisa” in Observator Cultural no. 382 (25 July-1 August 2007) [given the timeline of scholarly publication, I am attempting to give King the benefit of the doubt here …He would certainly do well to read Shafir’s most recent discussion in Observator Cultural NR. 148 (406) 17 – 23 ianuarie 2008, “Despre clarificari nebuloase, plagiate, imposturi si careerism,” to see what a venerable critic and serious scholar was subjected to as a result of deigning to not wholeheartedly embrace the Report. Shafir’s treatment by the Report’s zealots has little to do with the liberal democratic view of the open society the Report’s authors ceaselessly profess.] Finally, had Charles King bothered to read Ciprian Siulea’s “Tentatia unui nou absolutism moral: Cu cine si de ce polemizeaza Vladimir Tismaneanu?” (Observator Cultural, nr. 379, 5-11 iulie 2007, once again conceivably within the publishing timeline) he might have refrained from parrotting the polarizing and unhelpful plebiscitary logic applied to the Report when he closed “The question is now whether the commission’s report will be used as yet another opportunity to reject history or as a way of helping Romanians learn, at last, how to own it” (p. 723). This, of course, suggests a certain infallible quality to the Report—which is far from the case—a conclusion only enhanced by King’s willingness to focus on the “hate speech” directed against the Report, but yet failing to cite and discuss any of the Romanian scholarly criticism of it. Charles King, “Remembering Romanian Communism,” Slavic Review, Winter 2007, p 719. In King’s short article, he does not hesitate to make occasionally gratuitous citations for things he did not need to cite. Yet in discussing December 1989 and using the term “elsewhere”—which usually prefaces a description of “where else” one might find these things—there are no citations. “Although never exhaustively” is itself a gratuitous choice of words and far from accidental: in my last work on December 1989, I made light of how ridiculous it was for Daniel Chirot to claim that Peter Siani-Davies’ The Romanian Revolution of December 1989, an otherwise excellent work, was “near definitive” when so much was missing from Siani-Davies’ discussion—notably, for our purposes here, the question of dum-dum/vidia/exploding munitions. One could indeed be left with the impression that King intends to deliver a put-down, that some fellow Romanianists will no doubt catch, but yet deny the broader audience references to what he alludes and simultaneously protect his image from having delivered such a “palma” as the Romanians would say. It would appear that at least for readers of this paper, his goals won’t go completely fulfilled.